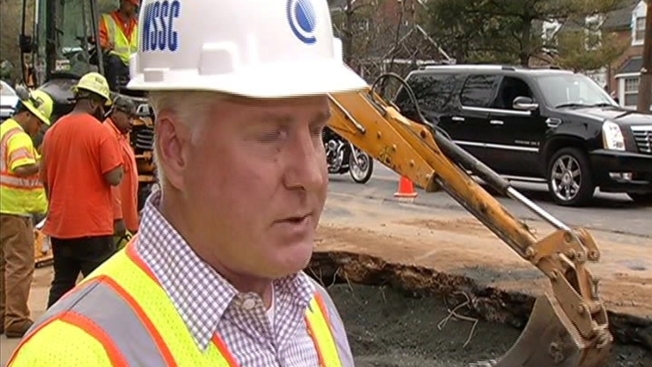 A water main break in Bethesda early Wednesday disrupted traffic during evening rush hour Wednesday. One southbound lane was open about 4 p.m. on the 9100 block of Rockville Pike near Cedar Lane. All northbound lanes were open. All southbound lanes were reopened about 8 p.m. The 75-year-old water main was confirmed to have broken about 1 a.m. Wednesday, the Washington Suburban Sanitary Commission said in a statement. "Fifty percent of our pipe is 50 years or older, and that type of pipe, a cast-iron pipe, that's past their live-by date," WSSC spokesman Jerry Irvine said. The water main had been repaired by about 3 p.m. but crews still were working to restore the roadway. A water main broke near the same location in October, as News4 reported. "We need to do what we can to get these pipes out of the ground and get new pipes," Irvine said. WSSC expects only one southbound lane to remain open through Wednesday evening. Drivers said they were fed up with the traffic. "It's usually terrible and now it's just worse," one man said.